‘Is that what you meant?’ He downshifted in front of the hotel, hooked a U-ey and screeched to a halt at the curb. The women unfolded themselves from the tiny backseat, straightened their hair, and cursed our recklessness as two bellhops ushered us through the big brass doors. Moments later we were back at the car, primped and ready. ‘The Mission District, and step on it,’ I said. And we were off again, barreling through the streets of San Francisco, just a little late for our evening at Delfina. What’s up with Tommaso’s? If we had any qualms about leaving our kids behind that weekend, they were put to rest in the first hour. Under a glorious blue sky, the Salad Queen and I walked up to North Beach, found a table in the sun and slipped into the blissful state that defines our relationship. A piece of veggie quiche, a glass of Prosecco and thou, my dear. Alas, it lasted only a short time and then we both got itchy. After all, there was a city out there to explore. Six miles of walking later, with many San Francisco hotspots bagged and under our belts, we landed at Tommaso’s, the oldest pizza joint on the west coast, opened by a guy named Frankie Cantelupo in 1935. This was a place that came highly recommended from several quarters. 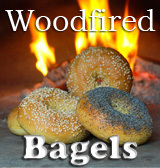 The brick oven was fabulous; a thing of wonder to a wood-fired fanatic, and the atmosphere was bustling. Avoiding the long central table which runs the length of the dining room, however, proved to be more challenging. After fits and starts we were moved to one of the white-painted booths off to the sides. I’d like to tell you Tommaso’s was worth it. But in a food-centric city like San Francisco, which boasts more restaurants per capita than any other U.S. city, the place was just so-so. Maybe it was an off night. The pizza was less than stellar, with a too-thick center and a rolled edge. The special potato pizza was dry and lacked a certain dimension of flavor. What saved our meal was their bog-standard cheese pizza dressed up with a topping of spinach and shaved Parmesan along with a memorable 2007 Napa Valley Sangiovese from Del Dotto Caves. The thing that really rankles is we left most of the potato pizza untouched, and nobody even came to ask why. Shame on you, Tommaso’s! A bagful of goodies: At Café de la Presse, a stone’s throw from the French Consulate, I had an excellent Oeufs Meunier the next morning – poached eggs with wild mushrooms in a red wine reduction – but it was all a mistake. Bellies full, we trundled our way down to what turned out to be the grazing event of the weekend, the Saturday market down on the waterfront at the Ferry Building. Ooh la la! If we’d had it all to do again, we would have surely saved ourselves for the market. Some pig bits at Boccalone? Wild mushrooms at Far West Funghi? 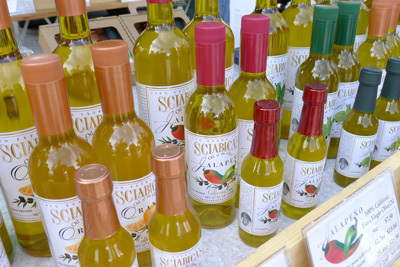 Olive oil from Sciabica’s? Fresh produce from Heirloom Organic Farms? A little of this, a little of that was the way to go here. The least we could do was to have a scrumptious pastry and a coffee from Frog Hollow Farm, whose line was 30-deep with everyone smiling as they walked away. Instead, I latched onto a lovely Levain Bread from Acme Bakery, and thrust it into my daypack for another day. The next day we breakfasted on omelets at our favorite faux 50’s diner near Union Square before heading to the Haight, but this time we made the right call. Lori’s is all decked out in chrome and formica and greaser-era memorabilia. Want a booth? No problem: there are tons of them. Dine in your car? Well, not quite, but there’s an old Edsel in the joint that’s set up with a tailgate table. Over in the Haight Ashbury district the yearly street fair looked like another foodie event but upon closer inspection it proved to be a lot of fast food decked out in tie dye. While the throngs of people were spectacular, it was a good thing we’d eaten elsewhere as the food was marginal. We did end up with some totally awesome tee shirts; it was the Haight, after all! Delightful Delfina: There were so many things right about our dinner at Delfina, from the moment we pulled to the curb and were shown to a table in the window with nary a wait. All evenings should go so well. 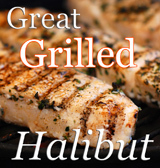 The food was good, the waitstaff was knowledgeable and the service was impeccable. Sharing it all with great friends made the moment precious. And Delfina made it all happen in a delightfully casual way. What makes Delfina stand out from the crowd is its depth. My admittedly non-foodie friends could just order and be happy with the results. But once the Salad Queen and I scratched beneath the surface, a whole world opened up. 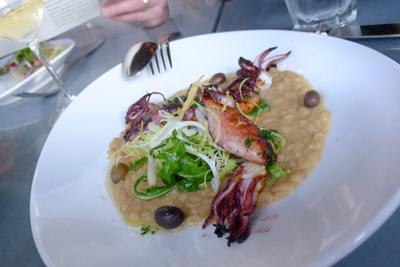 The beans under the calamari weren’t just beans, they were rice beans from Rancho Gordo. The chicken wasn’t just any old chicken; it was young Fulton Valley chicken, and the waitress could probably find out what breed it was if she didn’t know already. The bread on the table came from down the street at Tartine. In fact, every item on Delfina’s menu told its own story if you cared to ask the right question. Next time we’re in San Francisco, we’ll be sure to go back. Beyond the food scene: Climb the Coit Tower. Ride a streetcar to Ghirardelli Square. 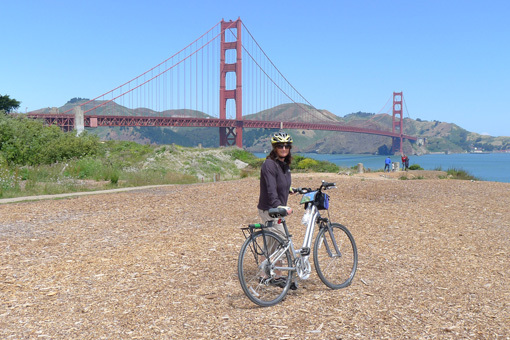 Bike to the Golden Gate Bridge. Shop at the craft stalls set up near the Ferry Building. Take in Alcatraz. And get out to Tiburon if you can. It’s not much of a foodie event, but it’s a great place to go with friends. 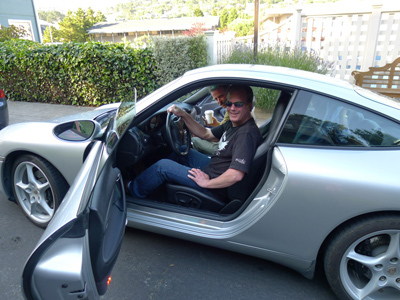 Especially in a sports car… we’re talking California, after all! A wonderful and timely post!! I’m actually from San Rafael, just north of the Golden Gate and went to school in San Francisco. My dad had a restaurant in Tiburon… last time it was there it was then called Guyamas, but in years past it was called the Windjammer and I was ultimately spoiled by the attentive waiters and waitresses and I was even allowed in the kitchen and got to scramble eggs once! My best memory is crawling out of my dad’s office over the restaurant itself and peering across the bay at the Ghirardelli sign after my special dinner. SF is my favourite American city, of those I have discovered so far. I haven’t been to any of the restaurants you’ve mentioned but SF has a great restartant on every block. I have so many favourites, once again from those I’ve visisted. I’m glad you had a great time! Isn’t it funny what people go for? When I was in SF (years ago!) I was all about the Chinese food … we ate in several little family restaurants in the Chinatown neighborhoods and had seafood one evening and then a show at a comedy club up on Cobb Hill? Russian Hill? … great fun. The highlight of ‘cool places’ for me was China Moon Cafe and this was when it was a relatively new place … love SF! PS – Got those tiles for my oven and the bread has improved dramatically! Love the article. Your poetic license improved on an already wonderful, eventful day. I liked it so much I shared it with my sisters and brother. That is two articles that feature me. Nice! Sounds like a wonderful trip! We’re headed there next week and I can’t wait!